For years, I have talked about my relationship with my father in my classes, as he was one of my greatest teachers and my most challenging relationship. Throughout my childhood and 20's I learned to endure his need for complete control. I bore his incessant irritability and shielded myself from his frequent bursts of anger. And, even while enduring him, I craved his approval and attention. I longed to feel more ease and love with him and around him, and of course within myself. In fact, it was this profound desire for peace and connection that fueled my journey deeper and deeper into the path of yoga. My father died on Valentine's Day, 2011. 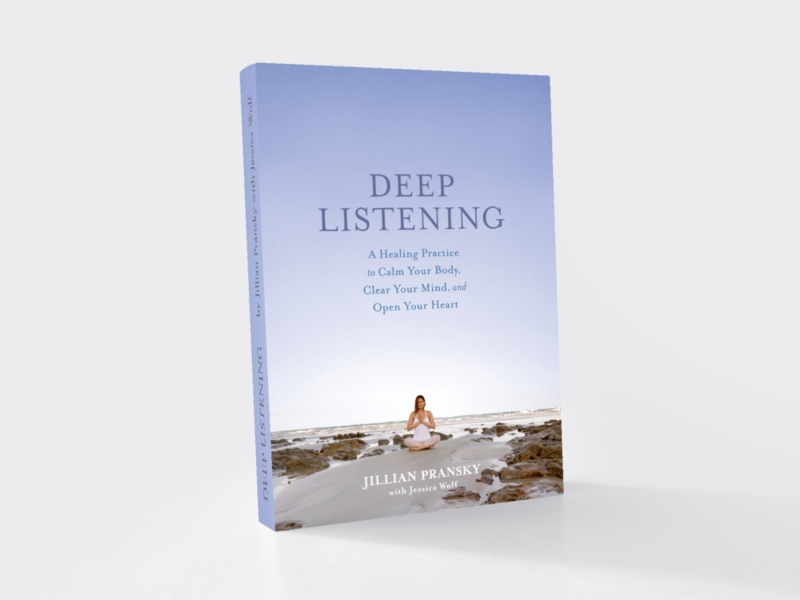 Fast forward: now at 49 years old and after 25 years of yoga and meditation practice, while writing my book Deep Listening, I tried to recall stories and feelings about my relationship with my father which would illuminate some of yoga's most potent teachings, but I could no longer evoke the salty sting of pain that I once wore like a badge of honor. The potency of those feelings—the sharpness, bitterness, and sadness that filled my journals for years—were just nowhere to be found. Today when I bring my dad to mind, I feel great warmth toward him. I see him through eyes of compassion rather than eyes of hurt. Throughout much of his life, my dad suffered physical and mental tension, serious illness, and childhood pain. It was hard for him to ever truly feel good, and deep connection to others did not come easily. Yet my practice has allowed me to see that even though it may not have been in the form I needed or wanted, my father loved me the best he was able. In the years before his death, I could recognize the ways in which my father had reached out to me and supported me. And the more I noticed those things, the more they seemed to happen. My dad would call me after seeing a segment about yoga on a morning TV talk show, excited to recount what he’d learned. He’d clip articles about meditation out of his Florida newspaper and mail them to me in New Jersey. Sometimes when I was visiting, we’d go out on his boat, and instead of insisting we go fishing (his passion), we’d motor around looking for dolphins (my joy). With his every gesture, I felt more loved. And in turn, I became more soft-hearted in his presence, something I never thought possible. After years of practice, most specifically Metta Meditation, much of my “Dad Salt” have dissolved. My body doesn’t hold those old experiences as “pain” any longer, and neither does my heart. My stories still live inside me, but they no longer own me. The grandfather explains that it’s as if we each have two wolves living within us. One wolf represents all that we consider good: kindness, courage, compassion, love. The other wolf represents the darker parts: fear, hatred, anger, greed. “The two wolves are in constant battle,” the grandfather tells the boy, letting him know that everyone struggles with their own conflict between darkness and light. “Which wolf wins?” the boy asks his grandpa. It is true that I do not feel the sting of my father these days, but this is also true: If I start telling myself my angry and hurt stories over and over, my “Dad salt” becomes concentrated all over again. And sometimes I do slip into those stories. But I now know that what I’m doing is feeding that dark wolf. I’m the one choosing which wolf to nourish and make strong. This is why Metta Meditation and conscious relaxation is at the heart of my practice. They help me learn how to stay relaxed in my body and mind with my more difficult feelings; recognize when I am closing down or limiting my experience of love and possibility. They help me remember that I have a choice what I focus on, and how I relate to it. This opens an opportunity to stop repeating limiting story lines. It makes room for more healing and nourishing feelings and perspectives. In fact, research shows that these practices produce a chemistry in our body-mind that further promotes the state of 'rest and digest' as well as "tend and befriend"; our ability to connect and be more intimate with ourselves and others (Kok et al - 2013). Below you'll find meditation and yoga practices to nourish your body, mind and heart - they will help you return to yourself and what you wish to grow. And share the Love! Send this along to a friend who may also benefit. For more inspirations and kind practices visit my Face Book Page each week in February. Enjoy this 12-minute Metta Meditation. Metta, is a particular meditation style that is a technique designed to intentionally expand compassion and love in your life. Enjoy this TedxTalk that speaks to the power of combining Metta with yoga practices to melt tension, release stagnant energy, and train the mind to be more spacious and present. In this open relaxed state, we can cultivate a transformative quality of friendliness towards ourselves.